With AudioQuest's Beetle, you can access all the music from your Bluetooth-enabled iPhone®, Android™ smartphone, iPad®, tablet, or laptop through your home hi-fi system — with wireless ease and convenience. And because this high-quality digital-to-analog converter (DAC) does a much better job than your player's internal DAC and audio circuitry, you'll enjoy much better sound quality, too. The Beetle's USB port give you a direct digital connection for your PC or Mac®. 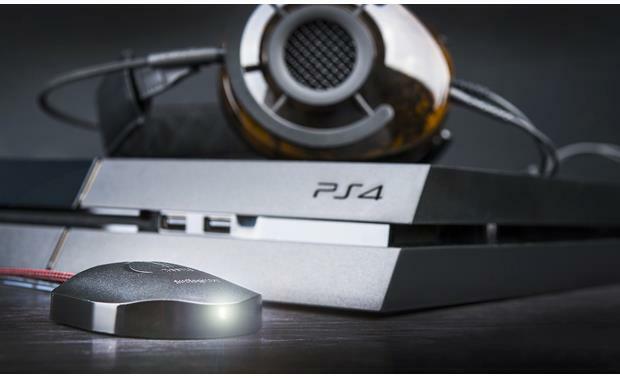 It bypasses the DAC in your computer, and decodes your tunes with superior audiophile-quality precision. The Beetle also features an optical input for plugging in a TV or Sonos CONNECT player. A line output lets you connect it to a receiver, self-powered speakers, or sound bar. You can also plug in your headphones directly to the Beetle for personal listening. Can this receive and transmit a Bluetooth signal? Yes, that is how I use it and it works well. I transmit with an ipad mini. Optical-Bluetooth-USB DAC: The AudioQuest Beetle is a multi-purpose DAC for today's many different digital audio sources. Capable of delivering naturally dynamic, uncompressed music via its high-performance optical (toslink) or asynchronous microUSB inputs, the Beetle also adds exceptional convenience and surprisingly beautiful sound through its asynchronous Bluetooth technology. Microchip MX Series Microcontroller: The Beetle is the first AudioQuest product to be built on the extremely efficient, ultra-low-noise Microchip MX Series Microcontroller platform. ESS 9010 DAC (w/ Minimum-Phase Filtering): At the heart of the AudioQuest Beetle is an ESS 9010 DAC that uses a sophisticated minimum-phase digital filter to provide more naturally detailed and dynamic music. The Beetle can accept audio and music files ranging from MP3s (128/256/320kbps) and CD-standard (16-bit/44.1kHz) to native Hi-Res (24-bit/96kHz), regardless of music file format. The Beetle will accept almost any digital audio you want to play from your TV, computer, or Bluetooth source device and make it sound dramatically better; whether your listening pleasure is iTunes or streaming music services such as Pandora, Spotify, Amazon, or Tidal. 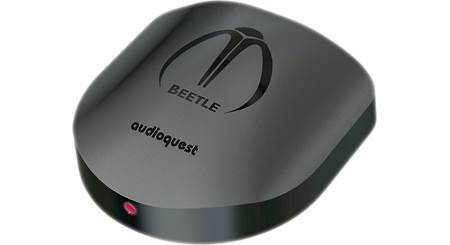 Compatible Sampling Frequencies: The AudioQuest Beetle will play music or audio data at 44.1kHz, 48kHz, 88.2kHz, or 96kHz. However, for the best sonic results your smartphone, tablet, laptop, or desktop computer should be configured so that it sends music and audio data to the Beetle that matches the "native rate" of the music. For example, since all CDs and music files purchased from iTunes are typically at a 44.1kHz sample rate, for many people 44.1kHz will be the best sample rate since this is the "native rate" of most digital music. Choosing a higher sample rate will convert your native music and audio data using mathematical approximations that can potentially decrease the sound quality. Conversely, if you have purchased high-resolution music files (96kHz), such as those available from HDtracks.com, configuring your computer for 44.1kHz (or any other lower sample rate) will cause the computer to down-sample your music to a lower resolution. When possible, always configure the computer to output the native sample rate of the music you are listening to. Note: If you have purchased a file that has a higher sample rate than 96kHz you need to configure your smartphone/tablet or computer/laptop to send the Beetle audio data at a resolution no greater than 96kHz, and for the best performance the sample rate you choose should be exactly half the sample rate of the file you're playing. For example; if you purchased a 24-bit/176.4kHz file, 88.2kHz should be selected, whereas if you purchased a 24/192kHz file, 96kHz should be selected. Directly divisible sample rates prevent the computer from doing sonically degrading, complex math in its conversions and allows Beetle to sound its best. 64-Bit, Bit-Perfect Digital Volume Control (USB & Bluetooth only): The Beetle is equipped with a bit-perfect, 64-bit precision digital volume control, enabling high-precision adjustment of output volume while in either the USB or Bluetooth mode. This ensure playback and adjustability with no sacrifice to the authenticity of the original music file. The optical digital output incorporates a Unity Gain volume control. To ensure bit-prefect playback and volume adjustability (for USB & Bluetooth), set the volume control of the playback application (such as iTunes or Tidal) to 100%. Then adjust the volume from your Windows PC, Apple computer, or mobile device (good starting point is 50%). 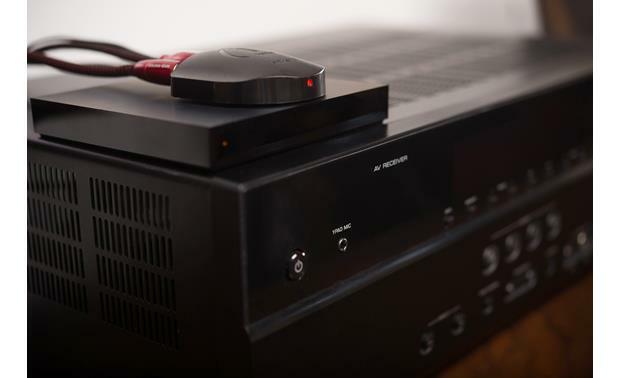 The optical digital input's volume will be controlled from your connected receiver, integrated amplifier, or powered speakers. 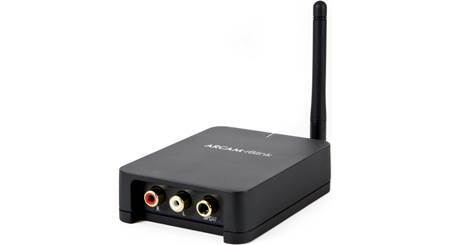 Asynchronous microUSB & Bluetooth: Asynchronous Bluetooth 4.0: The asynchronous transfer protocol, as applied to digital audio, allows the clock in an outboard digital-to-analog converter (DAC) to override the clock in a host computer, thereby significantly reducing the digital-audio distortion known as jitter. While asynchronous transfer has become a popular (and often preferred) technology in USB DACs, the same strategy can be applied to Bluetooth transmission. By sending audio data asynchronously over Bluetooth, the Beetle can greatly reduce the susceptibility to jitter. Streamlength Asynchronous microUSB: The Beetle features a microUSB-B 2.0 port for connecting your Windows PC, Mac computer, Apple iOS device or Android OS device. Rather than sharing crucial audio "data clocking" functions with your USB connected computer, laptop, or mobile device, the Beetle uses a very sophisticated Streamlength Asynchronous USB audio data transfer protocol which takes command over the timing of the audio data transfer, dramatically reducing digital timing errors. As a result, you get low jitter, low resource load, minimal packet errors, world-class audio playback, and reliable connectivity between the USB DAC and your computer, laptop, or mobile device. The Beetle supports 44.1, 48, 88.2, and 96kHz sampling frequencies with 16-24 bit rates. Windows & Mac Compatibility: Compatible with Windows PC (7, 8.1, or 10), as well as Mac computers (OS X 10.6.8 or newer). No additional drivers are required for Windows or Mac. Apple iOS Compatibility: Compatible with Apple iOS 9.2+ devices that have a Lightning or 30-pin connector. You will need an Apple Lightning to USB camera adapter or Apple 30-pin to USB camera adapter, plus a microUSB-to-USB cable (all sold separately - see Accessories tab) to make the connection. Android OS Compatibility: Compatible with most Android devices running Jelly Bean 4.1 or newer, provided that the device manufacturer has adhered to the USB specification and implementation, and supports audio over USB - otherwise known as USB Hose Mode. To verify that your Android device complies with isochronous USB audio, download and run the USB Host Check app. For a reliable media player that has its own built-in USB driver, ensuring reliable connection between your Android device and the Beetle, download the USB Audio Player Pro onto your Android OS device. 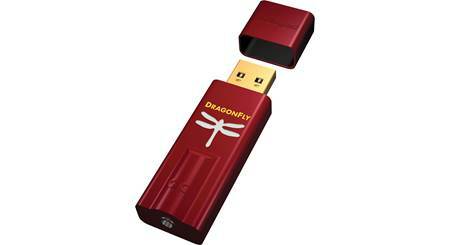 Connection requires using AudioQuest's DragonTail USB Adapter (sold separately - see Accessories tab) and the microUSB-to-USB cable that came with your Android device. Asynchronous Bluetooth: The Beetle is equipped with built-in Bluetooth 4.0 with support for wireless music streaming (A2DP) from your Bluetooth enabled source device (like your smartphone, tablet, laptop, or computer - including Apple iOS, Android, Windows, and Mac OS X). Thanks to the implementation of the asynchronous protocol, the Beetle is in total control of the incoming wireless datastream. Asynchronous data transfer preventively ensures the lowest possible level of jitter over Bluetooth, so you get the best possible wireless audio experience. The Beetle supports Bluetooth audio up to 48kHz @ 38kbps. Note: The Beetle can pair with up to 8 Bluetooth source devices, but only one can be connected at a time. You must disconnect USB or Optical input sources before trying to pair or connect a Bluetooth source device. 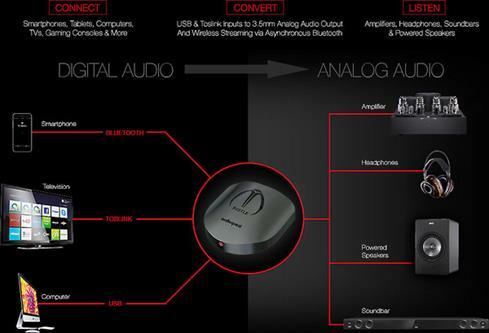 Optical Digital Input: The AudioQuest Beetle is outfitted with optical (toslink) digital input capable of supporting up to 24-bit/96kHz stereo PCM (16-24 bit/32-96kHz; 2ch). The Beetle incorporates ESS's patented Time Domain Jitter Eliminator to significantly reduce jitter over optical, raising both time-domain accuracy and signal-to-noise ratio for exceptional sound reproduction. 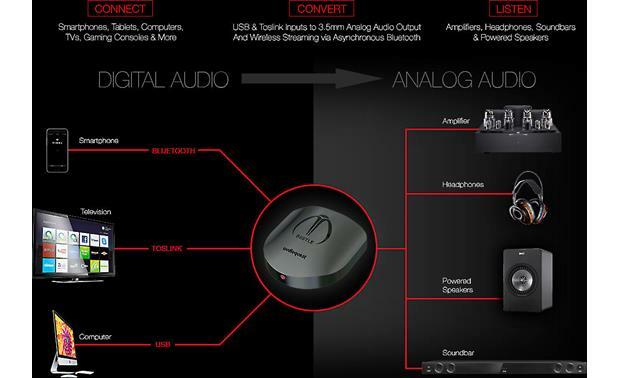 The optical digital input does not support Dolby Digital or DTS; make sure to set your digital audio source device's optical output to PCM or LPCM. Note: Most of today's TVs offer a toslink optical digital output connector for simple connection to the Beetle. However, many of today's laptops and portable digital audio players use a 3.5mm optical connector. In this case you would need one of AudioQuest's optical-to-mini cables or a toslink-mini adapter (both sold separately - see Accessories tab). 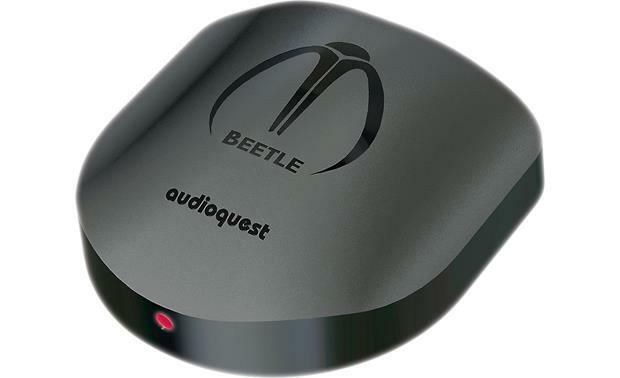 3.5mm Analog Output: The AudioQuest Beetle features a 3.5mm analog output (1.35Vrms) to connect your home audio system, soundbar, powered speakers, or set of headphones. You will need either a stereo minijack cable, stereo minijack-to-RCA cable, or headphones with a 3.5mm cable (all sold separately - see Accessories tab) to connect the Beetle. LED Indicator: A smart LED on the front of the AudioQuest Beetle indicates input and resolution of the incoming signal. Input Standby: Any input, while active will have exclusive control over the Beetle. If after 60 seconds, an input is not seen as active, it will time out; at which point access to any input will be available and granted on a first-come, first-served basis. Power Requirements: The Beetle's microUSB port is designed to accept power from the included external AC power supply, or both power and data from your computer or mobile device. The included analog-linear power supply should be used whenever the Beetle is not connected to a computer's USB port or your mobile device. Optional JitterBug (USB Data & Power Noise Filter): While the Beetle's included outboard analog-to-linear power supply offers pure, clean power for those preferring to stream music over Optical and/or Bluetooth, USB users will have to rely on the power provided by the host computer or mobile device which leave the USB connection vulnerable to sound-degrading noise currents and parasitic resonances. AudioQuest's JitterBug (sold separately - see accessories Tab) is designed to remove these unwanted noise currents and parasitic resonances from both the power & data communication streams over USB, resulting in improved dynamic range, warmth, and resolution of your music. Firmware/Software Upgrades: The Beetle is firmware/software upgradeable through a complimentary Windows PC or Mac OS X desktop application. As new developments arise in music player applications, streaming protocols, or other associated software; Beetle users will be able to incorporate those updates to their existing devices. I'm looking to use this device for a preamp and music player for an outdoor patio system that I am building. I want to connect my tv outside to the beetle, then the beetle to my amp and speakers to improve tv sound. When not watching tv, I want to connect my phone to the beetle by bluetooth to listen to music under the patio. Would this work? Also, how would I switch the source between the tv and bluetooth? Would I just turn off the tv so bluetooth could hook up to the beetle? I also believe that the toslink coming out of the tv can be set to adjust the volume signal going to the beetle, I just have to enable that setting under the tv settings. Any help would be appreciated. Thank you. Searches related to the AudioQuest Beetle Wireless Bluetooth® digital-to-analog converter.